Flea's World: Yes. On a Stick. Oh, I've been having too much fun again. For those of you who didn't care for the Crap Taco, you may not like today's post either. If that's the case, run away. I've been a busy girl. Not only did I design the following, but I've placed it on a t-shirt. hehe funny, but gross at the same time ! 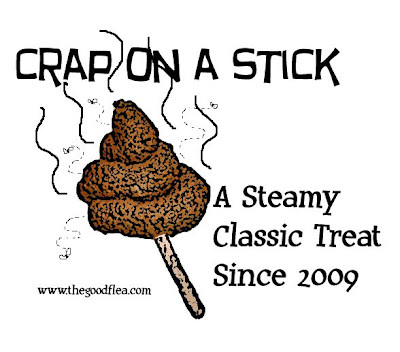 Maybe I should get one that says, "dealing with you is like crap on a stick." That way when I encounter rude people I don't have to say a thing, just turn and face them. Oh, man. I'm torn between laughter, disgust and admiration. You know what this means? You've got a million-seller on your hands! So funny and so disgusting in so many ways. OMGosh that is just wrong yet right all at the same time!!! Flea, Flea, Flea. What will we do with you? I think the best part of the whole thing is the little line at the botoom about it being a treat since 2009!